If you want to invest in distressed real estate in another city or state, how can you determine what a property’s ARV (after repair value) is? The remote flipper faces some challenges in finding and evaluating properties. However, as we explained in this post on how to find comps with Redfin, a solid technical toolbox is your best asset. Included in that toolkit should be the REI/kit ARV Calculator, which we walk through step-by-step in this article. As you read this article, keep in mind that the steps will become easier with practice. 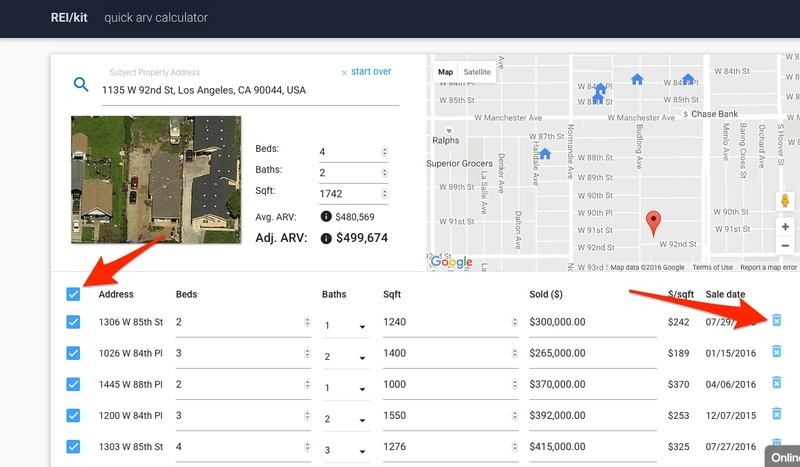 Practice will also allow you to have a great overview of property values of the properties in your target area. Having the right numbers to back you up will give you a needed boost. This, in turn, will help you to continue your due diligence on a property after establishing the ARV. 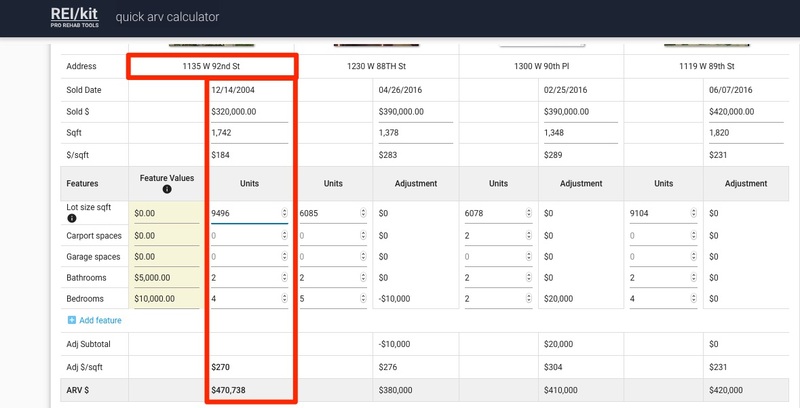 The REI/kit interface uses Zillow data to auto-populate available subject property information. These values can be clicked into and adjusted if necessary. At the same time, the interface also populates five locations. 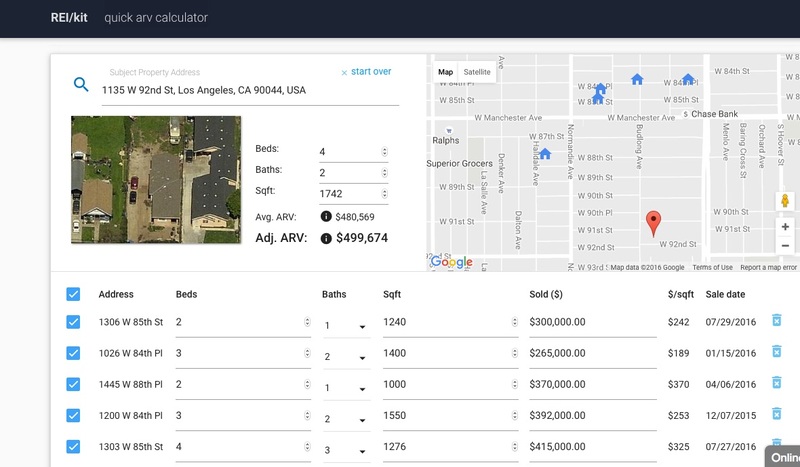 These suggested locations are what Zillow determines are comps based on their data. You should only use these suggested comps as just that — suggestions. To truly find the ARV you need to come up with your own comps. 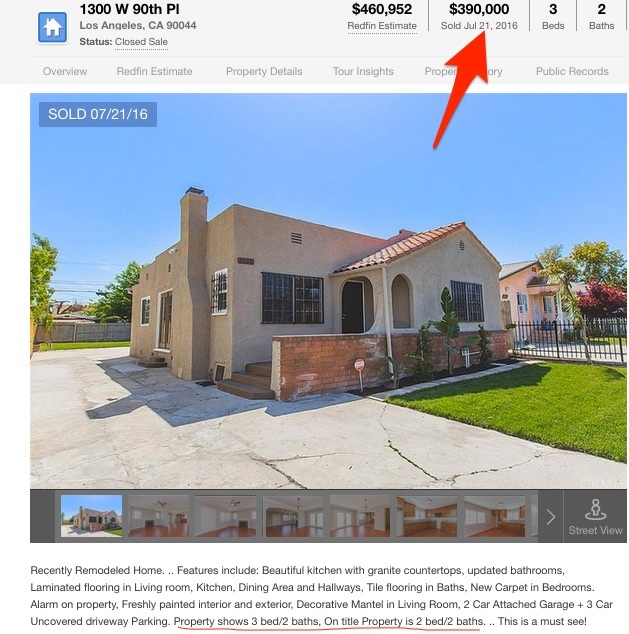 We outlined how to do this in the post on how to run comps in Redfin. 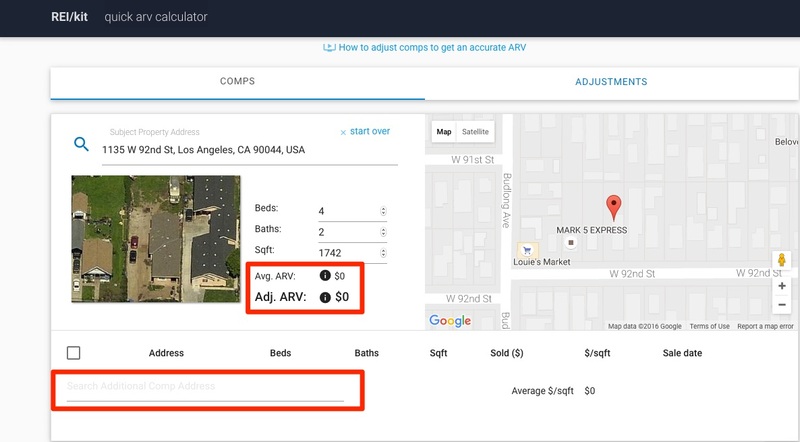 We will be writing another post explaining why you would want to input Redfin comps vs ones found from Zillow, but for now you’ll just have to trust us. REI/kit shows an adjusted ARV for those current five properties. We will be removing all five of those properties. Why? They are not the comps we discovered during our comps selection process using Redfin. We will be replacing them with the three we found to get to the true ARV of our property. 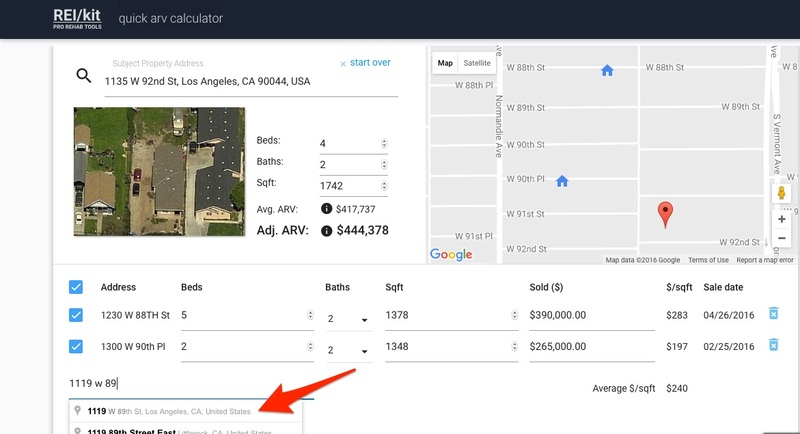 This additional search box also uses Zillow data to try to auto-populate property data. 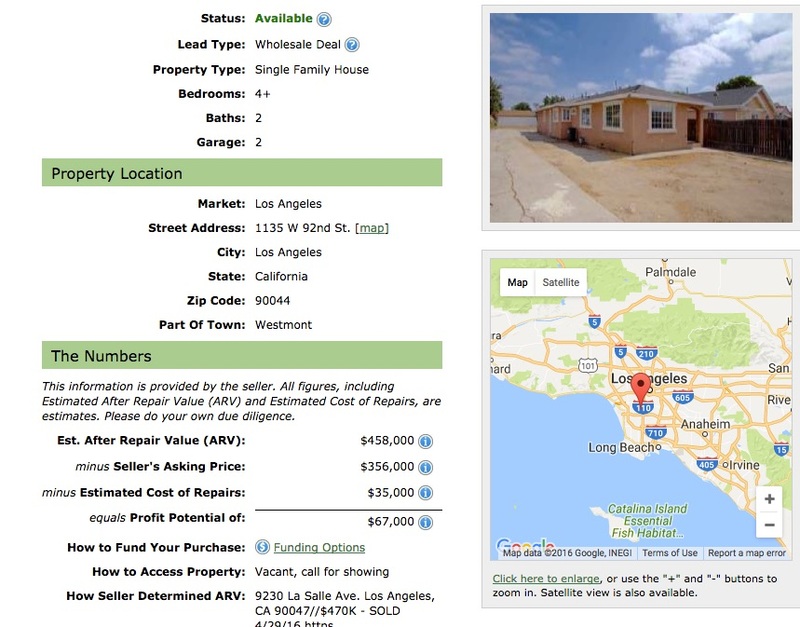 Zillow may not have complete, or accurate data. You should double check the property stats with those that you found on Redfin. It will then be necessary to adjust them. In this example below, we put the excel spreadsheet of comps and the REI/kit data side by side. Looking closely, we can see some issues. 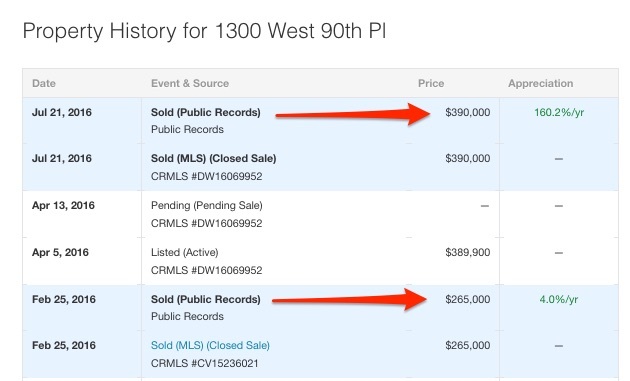 One issue is that the 1300 W 90th Pl (row 2) reports 3 beds in Redfin but only 2 from Zillow. Why might this be? According to the Redfin listing, the property “shows” 3 bedrooms, but only 2 are on file in the county records. It’s important to double-check your numbers and investigate when they don’t match. We are going to adjust the price of 1300 W 90th Pl in REI/kit. We click into the ‘Sold ($)’ column and type in 390000. Watch those Adjusted ARV numbers go up! We have finished inputting our comps in the Comps tab, so we move on to the next step in REI/kit. Now we perform a deep analysis of the comps in the Adjustments tab. The Adjustment tab has our updated data for 1300 W 90th Pl already populated. As in the Comps tab, you can also easily click into and update most fields. Second, the major focus of the Adjustments tab are the rows under the gray horizontal bar. Here, you adjust for value based on the Features, or amenities, of the comparable properties. One of the most confusing aspect of adjusting comps is in knowing where to subtract values and where to add values. 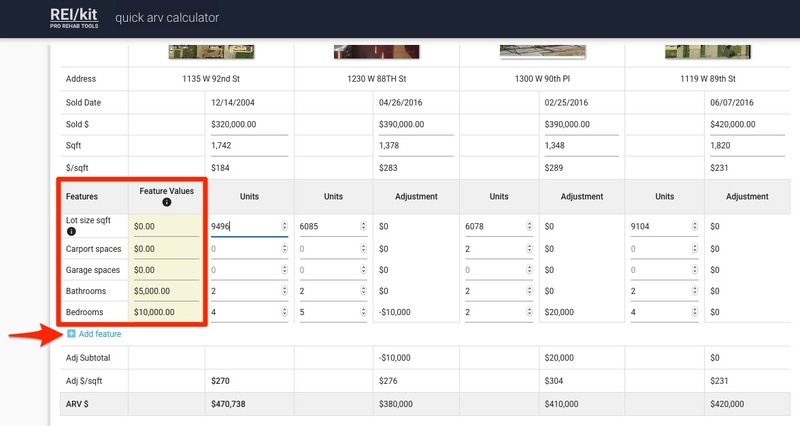 after choosing the number of features for your property, the REI/kit calculator does the hard work for us. It does this by by adding and subtracting values from comparable properties. You can see this at work when looking at the adjustments calculations above for the bedrooms and bathrooms. 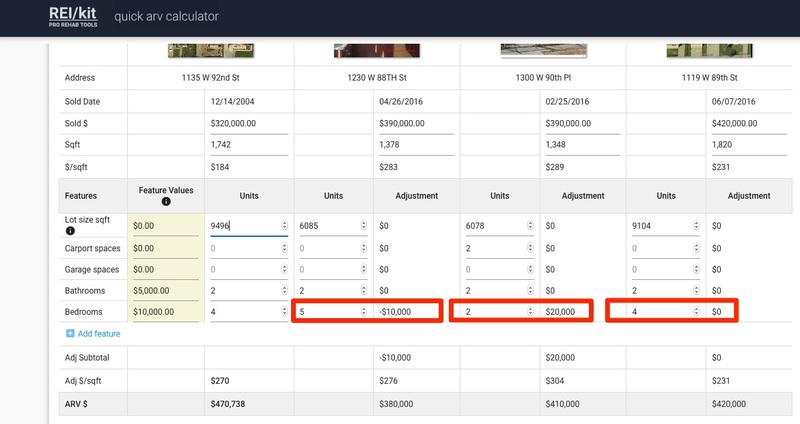 To illustrate, the subject property has two bathrooms, and since all of the comps have two bathrooms, there are no adjustments necessary for that feature. However, the subject property has four bedrooms, and some of the comps have more, and some have fewer of that feature. The sum value of those features gets automatically adjusted as seen in the adjustment columns next to each comparable feature. For example, 1300 W 90th Pl has only two bedrooms. 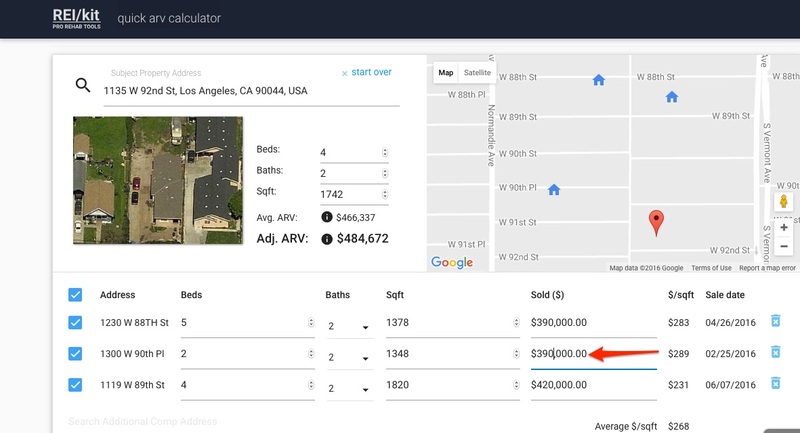 Since a bedroom feature has a value of $10,000 in that neighborhood, and our subject has four bedrooms, the calculator adds $20,000 upward to the value of our comparable. What does this mean? Essentially, you would have to spend an extra $20,000 to make the comparable the same as our subject property. To show an example of a downward adjustment, notice that the property at 1230 W 88th St has five bedrooms. In that case, it is “better” than our subject property in terms of bedrooms. So, the calculator adjusts the value of the comparable property downward by $10,000. Essentially, we would have to remove the bedroom from that property in order to make it look like the subject property. 1119 W 89th St has 4 bedrooms, so there is no adjustment necessary for that property’s bedroom feature. You always adjust the value of the comparables, because you know what their values are. You don’t know the value of the subject property, so you can’t adjust it. After all, you’re trying to determine it’s value. 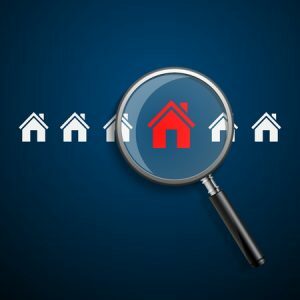 We’ve talked about how the adjustments work, so let’s now emphasize the importance of reviewing the listing details of the subject property and its comps. We must compare it to the information from the wholesaler, and also take note of the physical characteristics of each property. 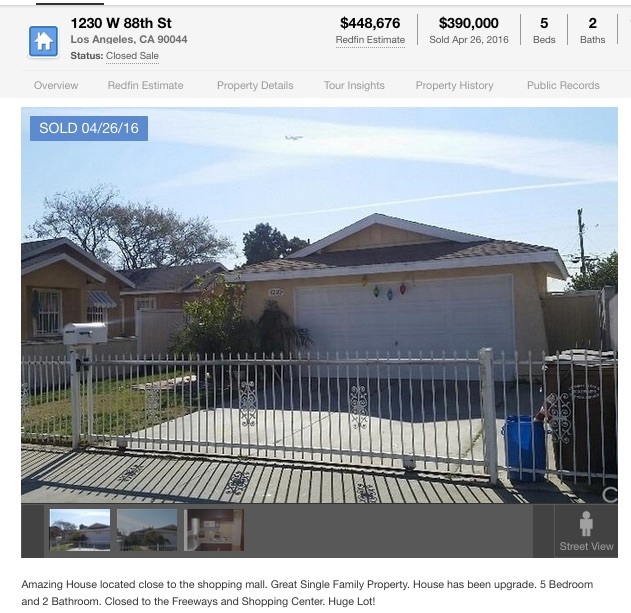 A quick check of the other properties in Redfin shows that all of them have a two-car garage. 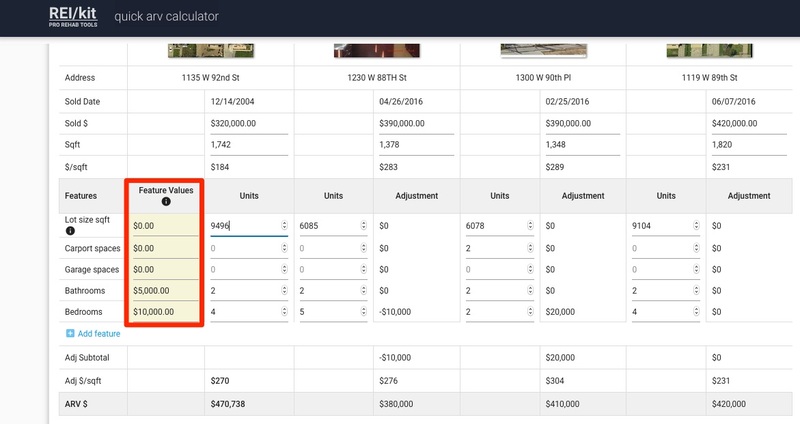 For properties that have all of the same feature that’s in the same condition, it’s unnecessary to add those features for adjustment. There simply is no adjustment. If, however, all properties but one had a garage, then adjustments would be necessary. In those cases you would want to add what a garage or garage space was worth in that neighborhood for adjustment. In this neighborhood, the value of a garage space is $10,000. We click into the ‘Feature Values’ field for ‘Garage spaces’ and type in 10000. 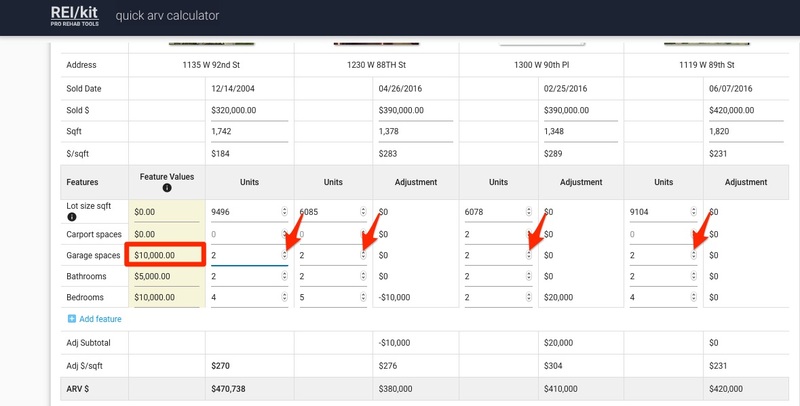 Then we have to adjust the number of spaces by clicking on the up or down arrows next to all five properties. Again, since in this case the number of garage spaces is the same across the board, we don’t need to adjust anything. You may choose to increase the number of units to two despite the fact that there is no adjustment, for your record. To underline — when looking at features, should there have been some properties with only street parking and some with a one-car garage, we would have adjusted those values accordingly. 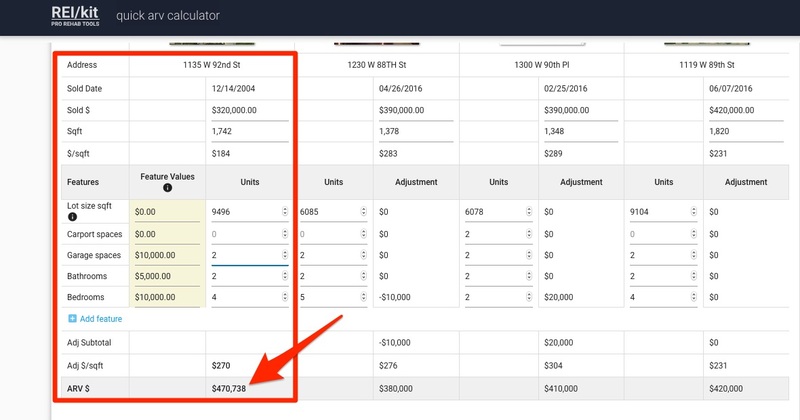 Now that we’ve double-checked our values and units and have a final ARV, let’s review what the wholesaler in Part 1 stated was their estimate of the ARV of the subject property: $458,000. Does that match what we came up with? Even better! The resulting ARV in the REI/kit ARV Calculator after a seven-step adjustment is $12,738 more than the amount that the wholesaler estimated. This is good news for us, and a good first step in the analysis process. There are many more factors to take into account before deciding to purchase a property. We go over those in future posts on flip costs and estimating rehab costs. The steps to arrive at an accurate ARV may seem overwhelming at first. With practice, however, you will find the process becomes much faster. 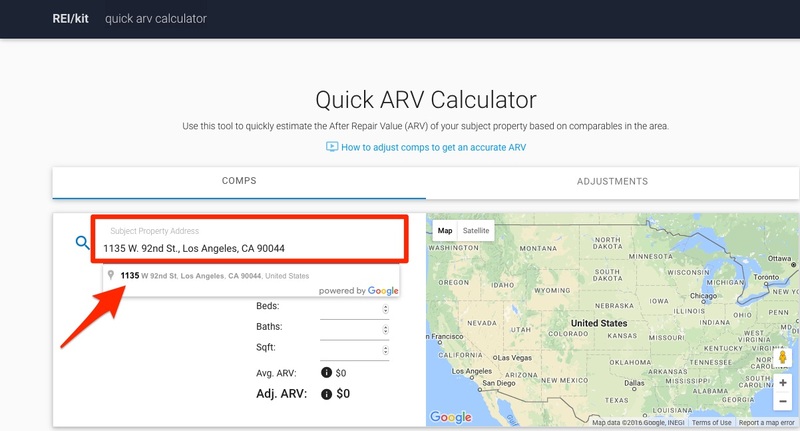 You will also start to get a very good feel for your target area ARV’s in general after evaluating a number of properties with the REI/kit ARV Calculator. Knowing your numbers will prevent you from making serious mistakes. Having a solid number will also give you the confidence you need to move forward on a deal. These are all skills worth honing.